[Advisory] SKY cable system upgrade - Hello! Welcome to my blog! 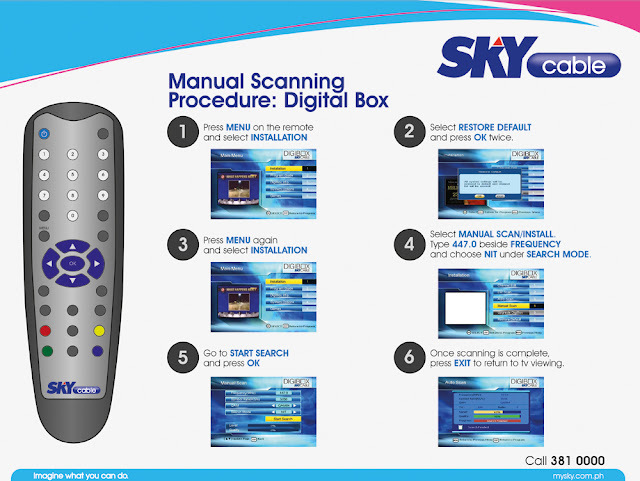 SKYcable recently conducted a system upgrade to enhance signal clarity for channels 12 (GMA7), 13 (Shop TV), 21 (SKY Preview Channel) and 163 (ABN). The process of upgrading involves transferring these channels to better streams. These streams may not be immediately detected by selected models of digital boxes when channel numbers are keyed in on the remote controls. Subscribers can troubleshoot this problem by following the procedures specified inhttp://www.mysky.com.ph/rescan. In the meantime, said channels may also be viewed using the channel up/down keys of the remote control to navigate. SKYcable also temporarily placed GMA7 on Channel 99 so subscribers can continue watching their favorite programs on this channel. SKYcable regrets this temporary inconvenience and extends its apologies for any difficulty brought about by this system upgrade. Your patience at this timewould be highly appreciated. For more information or further help with troubleshooting, contact SKYcable through it’s Metro Manila customer service hotline at 02-3810000 or SMS hotlines 0917-6310000 or 0918-8631000.